Hiring a professional and reliable maid for your cleaning services in Perth could give you enough time for you and to your family. You can then relax from a stressful day at work. However, when you look for one, be sure to have enough knowledge about the things you ought to know before hiring them. After all, your main goal is to look for the right maid for your cleaning services in Perth that can deliver excellent service. Reliable house maids won’t only provide you with an efficient house cleaning output and a hygienic house. As a matter of fact, there are also a lot of benefits you are likely to benefit from getting their service. One of these benefits includes the quality time you can spend with your family and of course the time to do what you most enjoy. 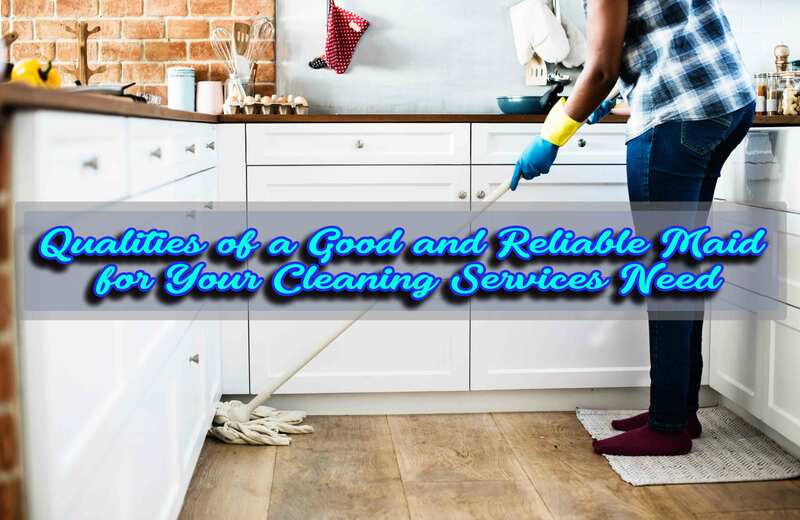 And to give you quick and useful thoughts about hiring professional maids, here are some of the qualities you need to look into before hiring a professional reliable house cleaner. Check this out! Before you hire a cleaner, you may try to list at least five to ten stress-busting tasks that could be the main focus for your service’s needs. Make a list of interview questions according to your priorities and requirements. Then after that, use it to evaluate the candidates and check if they possess this below top four qualities. Well, it’s advisable to have a housemaid who is hardworking. Of course, we all know that a cleaning task could be an overwhelming job to do. So, choose the one that has focus and determination to do her work regularly. Don’t choose or hire a house cleaner who spends most of their time watching and sleeping. Remember that a good maid for your cleaning services need will always find some task to do even in her free time. So given that, make sure that you hire a hardworking one. Another quality of a maid for your cleaning services need is that they should have the ability to communicate well. In fact, as a homeowner, you need to communicate with your house maid whenever you are at home. In this way, you can make sure that all your notes are well-understood. Well, it’s not really necessary that you need to choose a house cleaner who can speak fluently. But what you need to do is to choose the one that knows how to speak clearly. Because if you won’t consider this quality, it might be difficult for you to communicate with them which will result in misunderstanding. The quality of being honest is important to consider when choosing a good and reliable cleaner. After all, you might hear the quote “honesty is the best policy”. So, here’s the thing, when selecting a cleaner, make sure that you pick the one who is morally upright. This is because there are some maids that will not inform their employers about some issues that happened during the job. Say, for example, they broke some fragile items that may cause great damage or whatever issues it may be. And this is the reason why it is necessary to consider hiring honest maids. Also, having a trustworthy cleaner means that you can leave your house and go to work without worrying. So make sure that if you hire one, see to it that she could be trusted. Last but certainly not the least, a good maid should have initiative. It is indeed essential to hire someone that will do the daily task without being supervised or told to do so. Therefore, make sure to choose a maid that will make your work easier. And the kind of person that you can spend a little time training them on doing some important task. Keeping your home clean could be a never-ending task. In fact, it consumes a lot of our free time. And if your life may seem to revolve around mopping, vacuuming, dusting, and changing of bed sheets, then hiring a professional and reliable maid for your cleaning services need could be a great solution. Likewise, in choosing the right and good house cleaners, make sure to know their qualities. After all, this is for you to have a peaceful mind as they do the job. Are you now ready to look for Professional Cleaners in Perth? Well, you don’t need to go any further. Maid in Perth is what you need. Cleaning problem? No problem! Call us today and learn the variety of services we have. Our team of professionals will be happy to serve and help you out. Also, learn about the value in deep cleaning your home. Read our article: How a Proper Deep Clean Process Benefit You. This entry was posted in House Cleaning and tagged After Party Cleaning, Airbnb Cleaning, Apartment Cleaning, Carpet Steam Cleaning, Commercial Cleaning, Deep Cleaning, End of Lease Cleaning, Fridge cleaning, Grout Cleaning, Home Cleaning, Maid in Perth, Move In Move Out cleaning, oven cleaning, Spring Cleaning, Vacate Cleaning, window cleaning.